Fifty years is not a long time in the world of classical music, but it’s a very long time in the world of formal percussion studies. In the 1960s and before, the very notion of teaching percussion beyond the basic orchestral instruments caused music educators to simply shake their heads in disbelief. Professor Anthony Di Sanza, right, with members of the World Percussion Ensemble. Photo by Mike Anderson. Di Sanza’s tenure has been marked by numerous world premieres, commissions, recordings, and collaborations. In 2004, a doctoral program was founded, and two additional teachers are now on board: Todd Hammes and Tom Ross, both with specialties of their own. Now, almost exactly 50 years after the school’s first percussion concert, Di Sanza’s studio plans to celebrate. On March 20 at 8 pm in Mills Hall, the percussion ensemble will present a ticketed concert of music from the United States, China, Mexico, Brazil and the Middle East with emeritus professor James Latimer as guest conductor and Clocks in Motion, a four-year-old professional alumni ensemble, as guest artists. With the help of Latimer and many others, DiSanza has doggedly tracked down dozens of former students from over the years, and hopes that many of them will be able to attend. Buy tickets here or at the door. Adults $10.00/students of all ages are free. Latimer will conduct the ensemble in Carlos Chavez’s landmark composition Toccata for Percussion, which was performed on their first concert in 1965. But that’s only the prelude. In April, Di Sanza’s studio will embark on its first international tour, a ten-day trip to China to perform and also partner with students at the Shenyang and China Conservatories. The group was invited by percussion professor Lu Qingshan of the Shenyang Conservatory, whose former student, Zhang Yuqi, is now a master’s candidate at UW-Madison. There, they will play works by American and Chinese composers as well as music from the Middle East and Brazil. The trip is funded by the Wisconsin China Initiative, Dr. and Mrs. Robert W. Graebner, the UW-Madison Division of International Studies and the UW-Madison School of Music. Since the program’s founding fifty years ago, hundreds of graduates have established multi-pronged careers of their own, as teachers, as arts managers, as performers playing music from every tradition imaginable and on every instrument that makes a sound, which includes pretty much anything. 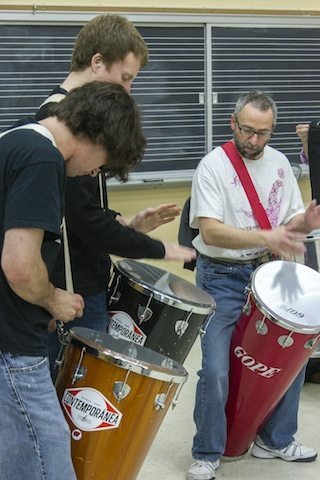 Want to know the full history of the UW-Madison Percussion Program from decade to decade? Download a timeline here.